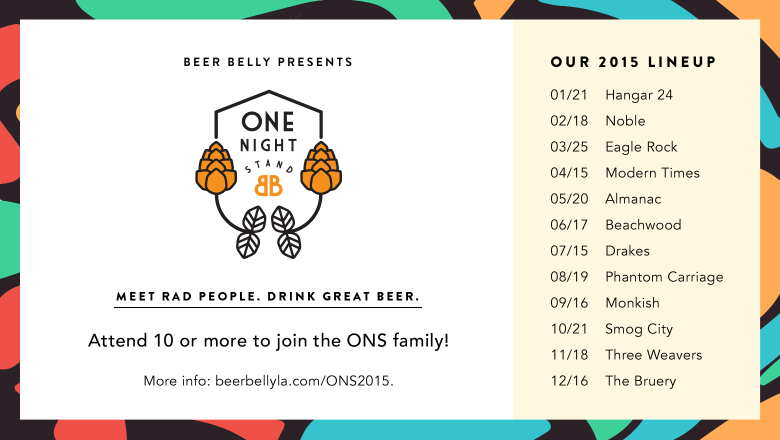 Click here to see this month's taplist and skip the mumbo jumbo Believe it or not, we've made it to our fourth year of the One Night Stand program, and we think this might be our best lineup yet. The formula is simple...meet rad people, drink great beer. And to top it off, those of you who make it to 10 out of 12 One Night Stand events get inducted into our exclusive group of ONS members. We're talking a special gift at the end of the year, and special perks at Beer Belly.This is quite a commitment though, and is not for the feeble. It's okay though, worst case scenario...you drink beer! All the details of participation are below, and we will be updating this page throughout the year with tap-lists for all of the upcoming events so be sure to bookmark this page and check it diligently. Post your photo to the Beer Belly Facebook page as proof! Don't just tag us, it needs to be posted to our page to count.